Heat and humidity in Japan won’t keep the fun from happening, and TDR promises to turn up the heat with its annual Summer Festival. The common picture of summer in Japan involves street festivals, dancing, carnival games, food stalls, and fireworks. Basically it is a time to go outside and make the best of the hottest months of the year. 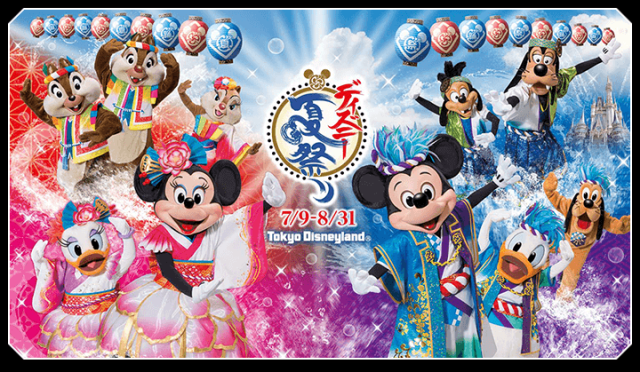 It’s no different at Tokyo Disney as they celebrate the season with lively dance performances, rhythmical drum beats, and lots and lots of water. If you are looking for a uniquely cultural experience at Tokyo Disney, let it be the summer festival. 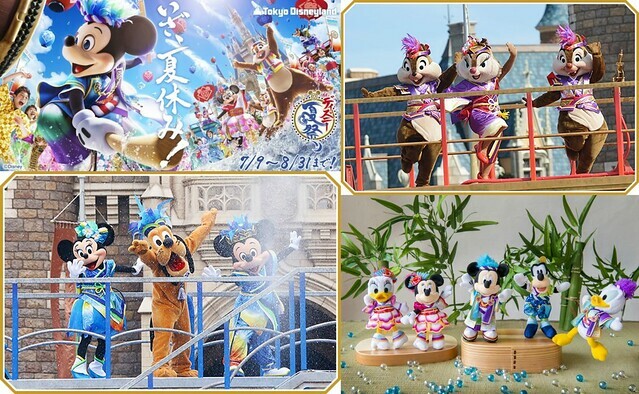 Beginning July 9th until August 31st, Tokyo Disney Resort will be celebrating Summer Festivals in both parks. At Disneyland, the summer festival is titled Natsu Matsuri since it is based on traditional summer festivals in Japan. 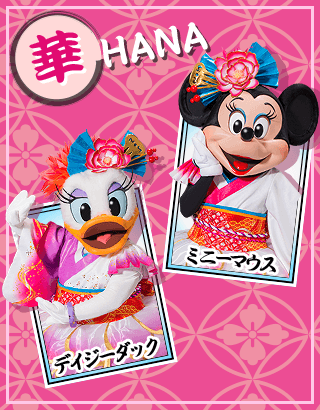 Mickey and friends will be dressed up in traditional summer festival performance garb with modern elements which are most notably seen in Daisy and Minnie. There will be many photo ops thanks to park decorations. The main event is titled Sairyoukabu 彩涼華舞 and is a dance event reflecting summer themes and based on traditional Japanese summer festival taiko performances. It’s promoted as an event that “combines the 3 themes of colour, cool, and flowers to create an entertaining performance”. I am always impressed to see the passion and intensity of these dances in spite of the heavy humidity. Clockwise: the promotional ad, last year’s dance performance groups, and the plush toys in their new costumes. The dance performances last summer was based on a sort of dance battle. 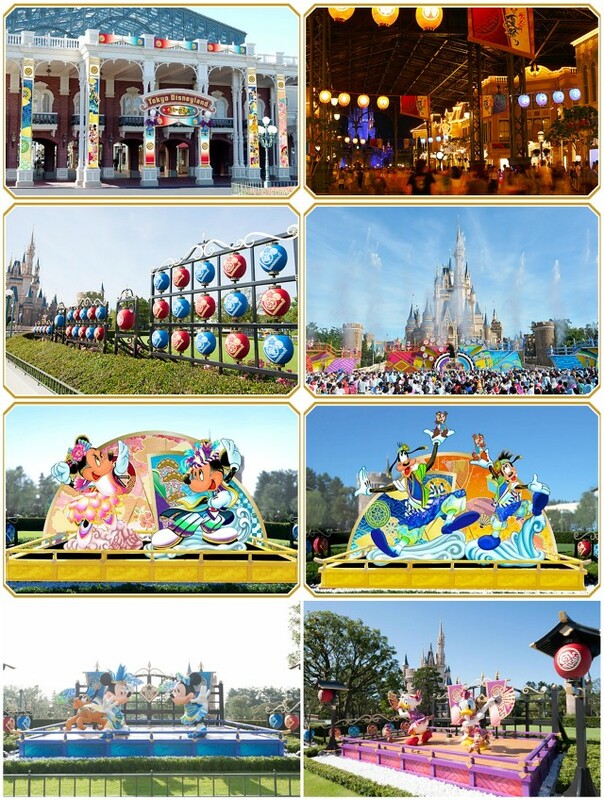 This year, Mickey and friends will be united as one troupe but subdivided into 4 smaller groups. Essentially meaning that each group will have its own performance before coming together in the end for one big finale. The first group is Sai 彩 meaning “colour”. 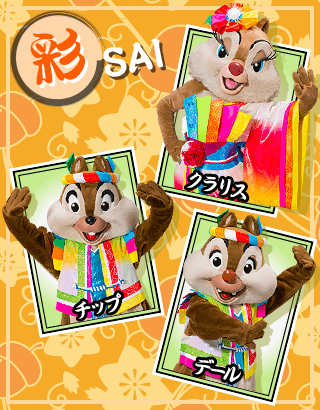 The group consists of 3 members of the chipmunk family in Clarice and Chip & Dale. Their brightly coloured costumes appropriately reflects the group theme. The second group is Ryou 涼 which in essence means “cool” as in the sense of “feeling refreshed or to cool off”. The group consists of Goofy and Max. The third group is Hana 華 which is an all-encompassing word of anything related to “flowers”. The group naturally consists of Disney girls Minnie and Daisy adorning floral-themed costumes. The final group is Yuubu 雄舞 which doesn’t have a direct translation but the first character roughly stands for “male” or “masculine”. Simply put, it is meant to reflect a “powerful performance” and it compromises of Mickey, Donald, and Pluto. Themed to a Japanese festival, this program builds to a climax through the Disney Friends’ exhilarating dancing amid a torrent of water showering down on everyone. 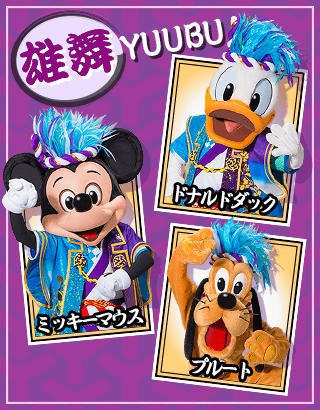 Unlike in previous years when the Disney Friends were in competing dance teams, this year they combine into one team to make “Disney Natsu Matsuri” even more exciting. The team is made up of four groups. 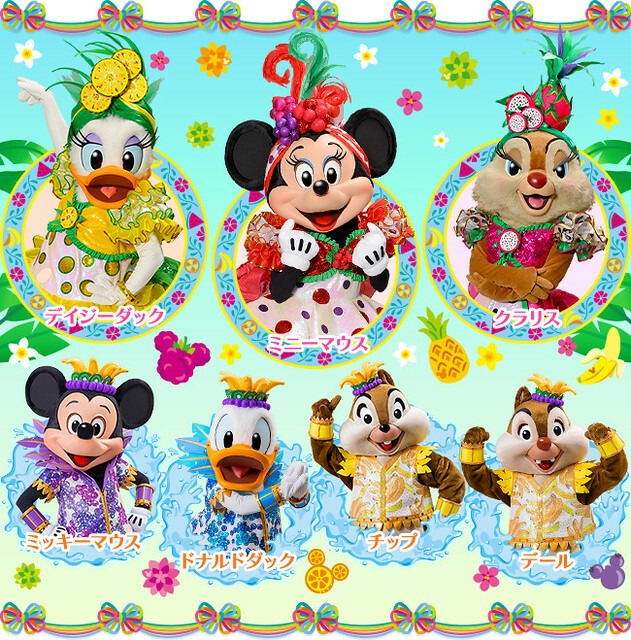 Chip, Dale and Clarice are in the “Sai” (color) group; Goofy and Max in “Ryo” (coolness); Minnie Mouse and Daisy Duck in “Hana” (flower); and Mickey Mouse, Donald Duck and Pluto in “Yubu” (heroic dance). With new costumes and music, they show off their new dance performance. Each group, riding on a colorful float, arrives at the Castle Forecourt in front of Cinderella Castle and the show begins. With water spraying from the floats, they make their way around the parade route in a festive way. At the finale, the groups converge at the Castle Forecourt. As water pours down all around, the unique dance styles of the four groups heat up the show and draw in all the Guests to join the Disney Friends in an exhilarating dance. Notes: The floats of the four groups will spray water both in front of Cinderella Castle and along the Parade Route. Attendance for the viewing area directly in front of Cinderella Castle is based on a lottery system. The lottery can be acquired at the Tomorrowland Hall (see « on map). 1 group is only allowed 1 lottery attempt each day. Passports of all the members of your attending group will be accounted for as 1 attempt. Location of the lottery in Tomorrowland. Outside of this particular area, you are allowed to view the show without having to go through the lottery. 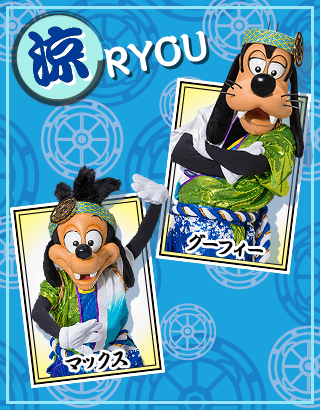 At Disney Sea, the summer festival takes on a more tropical and latin note. There is also a higher chance of creating a splash as the main event takes place on the waters of the Mediterranean Harbor (and as such, you may get wet). Following this theme, many areas throughout the park are decorated with elements of fruits and flowers. Clockwise: the plush toys in their new costumes and stills from the harbor show. 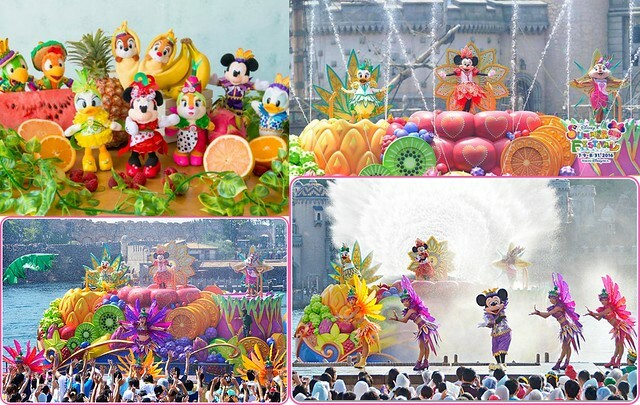 The fruitful themes are most notably seen at the title show of Minnie’s Tropical Splash with Mickey and friends dressed in costumes bearing images of fruits and atop of floats in similar manners. The show carries a latin vibe inspired by the likes of classic Disney movies “Saludos Amigos” and “The Three Caballeros”. Additionally, Jose Carioca and Panchito Pistoles from the aforementioned movies will join the show for the first time this year. There have been revisions to the costumes this year. Daisy is of pineapples, Minnie is berries, Clarice is dragonfruits, Mickey is grapes, Donald is blueberries, and Chip & Dale is bananas. The “hot” but “cool” water program, “Minnie’s Tropical Splash,” is back again this year to fill Mediterranean Harbor with tons of spraying water. This year, Jose Carioca and Panchito have come to add even more excitement to the event. 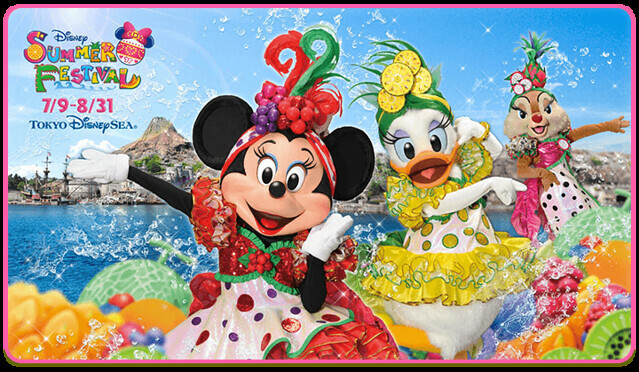 The “carnival queens” Minnie Mouse, Daisy Duck and Clarice in gorgeous new costumes appear in Mediterranean Harbor on a boat with colorful motifs of luscious, tropical fruit. From the boat, Minnie opens the carnival in celebration of the rich harvest of fruit and the hot Latin music begins to throb as the carnival fun begins. To increase the excitement, Mickey Mouse, Donald Duck, and their pals start to spray water from the boats and the shore. The Guests get involved and the carnival heats up even more. For the finale, Jose Carioca and Panchito appear and do the new “banana dance” as the tropical carnival reaches the heights of fun. 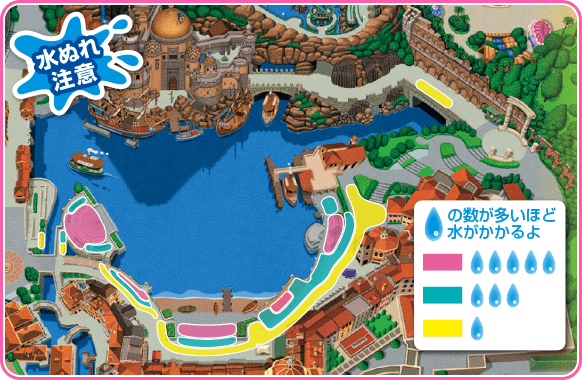 For informational purposes, Tokyo Disney has provided an outline showing the degree of “wetness” guests may experience from the main show. The higher the number of raindrops, the greater the chance of getting wet. The pink areas are the most wet followed by the teal areas, and the yellow areas being the least. 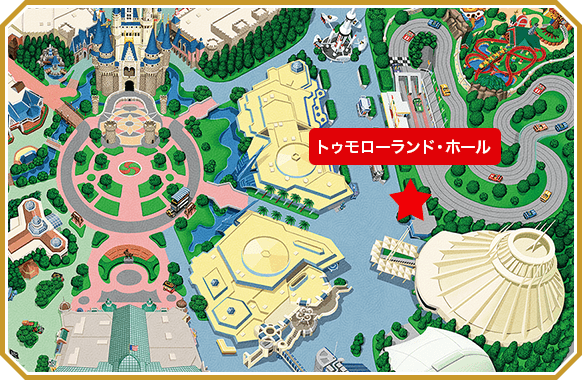 Images credited and © Tokyo Disneyland Event Page and Tokyo Disney Sea Event Page.